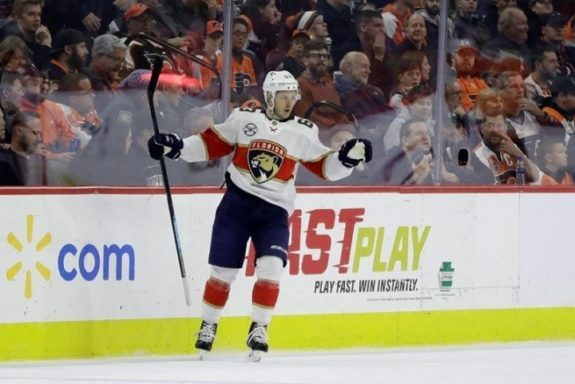 PHILADELPHIA — Aaron Ekblad and Evgenii Dadonov scored goals, Roberto Luongo made 29 saves and the Florida Panthers beat the Philadelphia Flyers 2-1 Tuesday night for their fifth straight win. Ekblad scored his first goal this season to give the Panthers a 1-0 lead almost midway through the second period. Shortly after Ivan Provorov’s tripping penalty gave Florida a power play, Frank Vatrano deflected Mike Hoffman’s slap shot and the puck trickled to the left side of the net. Ekblad flipped a backhander that hit goaltender Brian Elliott’s stick and glove before going into the net. NOTES: The Flyers beat the Panthers 6-5 in a shootout on Oct. 16. The teams meet one more time. … Panthers began a season-high six-game road trip. … Flyers played the middle game of a five-game homestand. … Dadonov has four goals in the last six games. He has six goals in seven career games against Philadelphia. … Ekblad hadn’t scored a goal since March 29 last season, when he recorded his career-best 16th goal. … Hoffman has a point in 13 straight games and Dadonov’s points streak has reached 12 games.